In German concentration camps, some Jewish prisoners were selected by their Nazi captors to hold more-advantaged positions within the population of the camp. This not only allowed them some protections, but also made them targets of disdain from other victims. 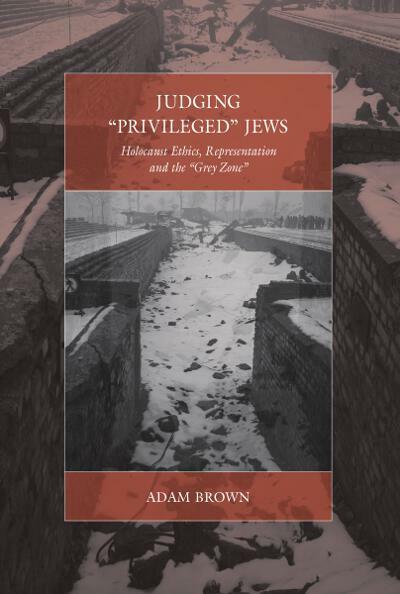 Author Adam Brown sheds light on these “privileged” few in his volume Judging “Privileged” Jews: Holocaust Ethics, Representation, and the “Grey Zone,” published in July of last year. Following, Brown discusses about the origins of his interest in the Holocaust in general, and in this inspirational “Grey Zone,” in particular. The evolution of my book, Judging “Privileged” Jews: Holocaust Ethics, Representation and the “Grey Zone,” was – like most books no doubt – somewhat long and complex. To take the long-term view, the project began when I heard the moving personal stories spoken by survivor guides on a high school trip to the Jewish Holocaust Centre in 1999. As a non-Jewish teenager with next to no background knowledge of the event, the visit to the JHC inspired a lasting curiosity and sense of obligation to find out more. A shorter-term perspective might see the book as beginning when a friend emailed me the program for the annual Jewish Film Festival at the Australian Centre for the Moving Image some ten years ago. On that program was a film called The Grey Zone, written and directed by Tim Blake Nelson and first released in 2001. The film depicts the traumatic experiences of the twelfth Sonderkommando (“special squad”) forced to work in the gas chambers and crematoria of Auschwitz-Birkenau, and offers a complex, unsentimental engagement with the extreme ethical dilemmas that many Holocaust victims confronted. On the train journey to the screening, I read Primo Levi’s highly influential essay entitled “The Grey Zone,” which influenced Nelson to delve into the same issues of moral ambiguity and “compromise” in his film. Both of these texts, some of the few to focus explicitly and centrally on the taboo issue of “privilege,” have stayed with me to this day. In this context, the term “privileged” Jews refers to those prisoners in the Nazi-controlled camps and ghettos who held positions that gave them access to material and other benefits beyond those available to other Jews, particularly the members of the Judenräte (Jewish councils), Ordnungsdienst (Jewish police), Kapos (chiefs) of labor squads, and other prisoner-functionaries. These victims have often been seen to have acted at the expense of fellow prisoners in various ways, for various reasons, and under varying levels of coercion. Meditating on their unprecedented circumstances, Levi provocatively argued that victims who were forced to cooperate with their Nazi persecutors in order to prolong their own or their families’ lives should not be judged for their behavior. As Levi highlighted while writing in the 1980s, judgements of “privileged” Jews are frequently problematic, and such judgements continue to permeate society and culture to this day. Yet whether or not moral evaluations are appropriate, they are also inevitable (the very nature of language makes them so), and Levi himself could not suspend judgement of those he argued should not be judged. Taking Levi’s “grey zone” as a point of departure, Judging “Privileged” Jews explores the portrayal of the Sonderkommandos and other categories of so-called “privileged” prisoners in survivor testimony, historical writing, and documentary and fiction films. More specifically, I analyze the ways in which moral judgements are passed in various representations, from Raul Hilberg’s influential writings to Claude Lanzmann’s Shoah (1985) and Steven Spielberg’s Schindler’s List (1993).